…is now my current place of residence. 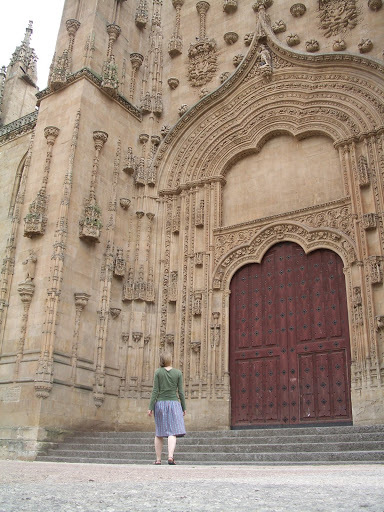 The University of Salamanca was founded in 1218, and it’s still a thriving center of learning for students from all over Spain and all over Europe. There are even a fair amount of American students here, since the University of Salamanca hosts a few Spanish language study abroad programs. After five weeks of a traveling in a group, hopping from city to city, cramming in as many sights as possible, and working long archive days, Salamanca has been a perfect change of pace. I’m on my own, and I couldn’t be staying in a more perfect location. I’m on the Rua Mayor, the main street that connects the Plaza Mayor to the Cathedral. So I’m right in the middle of it all! Oh, and I went to the cine last night–there’s an old theater in town that shows old Spanish movies. So I thought I would check it out. When I got there, though, it turned out that they’re currently doing a Brasileño movie series. So the film, from 1964, was a película Brasileña with Spanish subtitles. I was able to read all the subtitles and keep up with the film. But it was, honestly, the strangest movie I have EVER seen in my entire life. So that’s my life right now: all morning while the Archivo Diocesano is open, I work with four-hundred year-old parish books searching out the genealogy of the Salas family, who are friends and clients of the Ryskamps. The research is going spectacularly and I’ve extended the family tree back two generations and added siblings too, woot woot! Then when the archive closes, I take my sketchbook and camera, like the tourist that I am, and go exploring. Oh! And I gave a talk here in the Salamanca branch on Sunday! My first time speaking in church in Spanish (I hope I have occasion to do it again!). I’m really proud of myself because my talk was more than ten minutes long, and I was able to speak a lot of it from memory rather than just reading it. Since I came to Spain, I’ve been learning Spanish like crazy—but when I gave my talk it was like something magical clicked in my brain and now I really truly speak Spanish. I don’t know how to describe it. But it’s a really cool feeling. Cool, Kimberly! And like Alecia said, Ugh Spain! Mucha and Art Nouveau = the shiz.So you found the frog, eh? I told you what it meant didn't I? the "M"-word within a year! *gasp*Were the astronaut and icecream cone on the University or were they on one of the cathedral entrances?